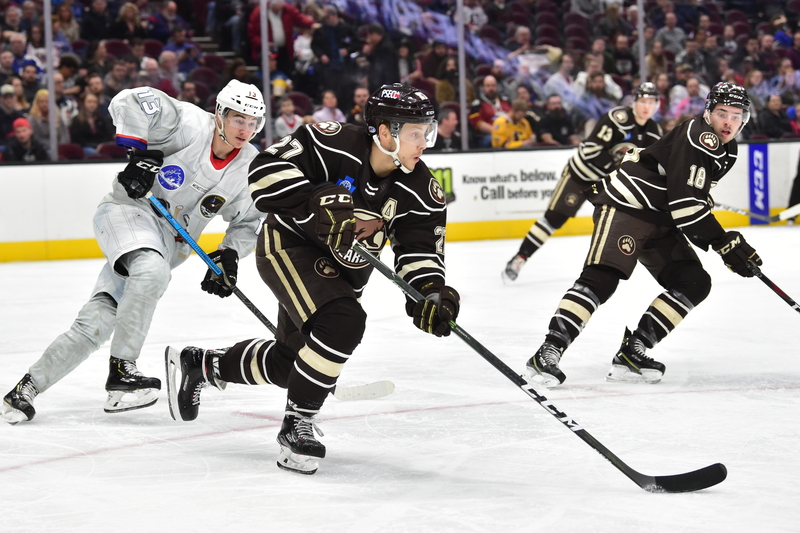 The Hershey Bears fell to the Cleveland Monsters 5-2 Saturday night at Quicken Loans Arena in Cleveland. The loss drops the Bears record to 36-23-3-4 (79 points) on the season. The two teams conclude their weekend set on Sunday. Game time is set for 3:00 PM. Scratches: Kris Bindulis (upper body) and Hampus Gustafsson (illness) were the injury scratches. Tobias Geisser, Max Kammerer, and Joe Snively were the healthy scratches. Defenseman Tyler Lewington was recalled by the Capitals on Saturday and did not make the trip to Cleveland. The Monsters opened the scoring with a goal from Tommy Cross at 11:21 of the first frame. The shot came off the faceoff, beating Samsonov low glove side. The Bears would battle right back with a goal from Steve Whitney at 12:18 of the first frame. Shane Gersich stole the puck from behind the goal and made a nice feed to Whitney for the tally. Shane Gersich (15) was credited with the lone assist. The first period would end with the game tied 1-1. The Bears outshot the Monsters 15-12 for the first 20 minutes. Both teams were 0 for 2 on the power play. The Bears would briefly take the lead with a goal from Mike Sgarbossa just 13 second into the middle frame. Riley Barber (28) was credited with the lone assist. But the Monsters would quickly answer with a goal from Alexandre Texier just 47 second into the middle frame, making it 2-2. The Monsters would retake the lead with a tally from Kevin Stenlund at 14:05 of the second period. Stenlund faked-out Connor Hobbs and then fired a low shot that beat Ilya Samsonov far side. The period would end with the Monsters leading 3-2. The Monsters outshot the Bears 17-10 for the second period and led 29-25 after 40 minutes. The Bears were 0 for 4 and the Monsters 0 for 3 on the power play through two periods. The Monsters would stretch their lead to 4-2 with a power play goal from Zac Dalpe at 6:43 of the final frame. Ilya Samsonov would take a stick to the head and fall to the ice for a brief period, but would finish the game. The Monsters would add an empty net power play goal to make it 5-2, and that would be the final. Bears first trip to Cleveland since the 2016 Calder Cup finals (here). The Monsters outshot the Bears 38-35 for the game. Ilya Samsonov stopped 33 of 37 for an .891 game save percentage. Aaron Ness led the Bears in shots with 6. The Nathan Walker, Jayson Megna and Devante Smith-Pelly line was -3. The Bears were 0 for 5 and the Monsters 2 for 6 on the power play. Who knew @theqarena had zero gravity tonight too?! This entry was posted in News and tagged Cleveland Monsters, Hershey Bears, Jon Sorensen, Mike Sgarbossa, Steve Whitney. Bookmark the permalink.